The Surf Center Arte Vida, in Tarifa, and NorthSails Spain have worked together with Xavier Mandico (pictured), a blind sports man who has developed a program for blind windsurfers. 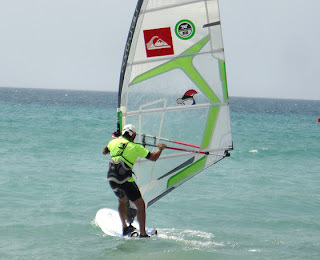 Using a radio set Xavier is connected to a second windsurfer and is therefore able to do what he always wanted to do: Windsurfing! Now he is planning the next step: crossing the strait of Gibraltar. Xavier Mandic is 42 years old and lost his vision at the age of 26 due to high exposure to solar radiation in the high mountains, combined with a genetic disease. In January 2009, Olivier Brisse set a world record for distance sailed on a windsurfer by a blind person, in Dakhla, Morocco.